While I hate the idea of ‘resolutions’, the start of the new year is a good time to start change, no matter how small. This change can come with cooking at least one dinner a week, adding more vegetables to your meals, or experimenting with ingredients you may have never tried. 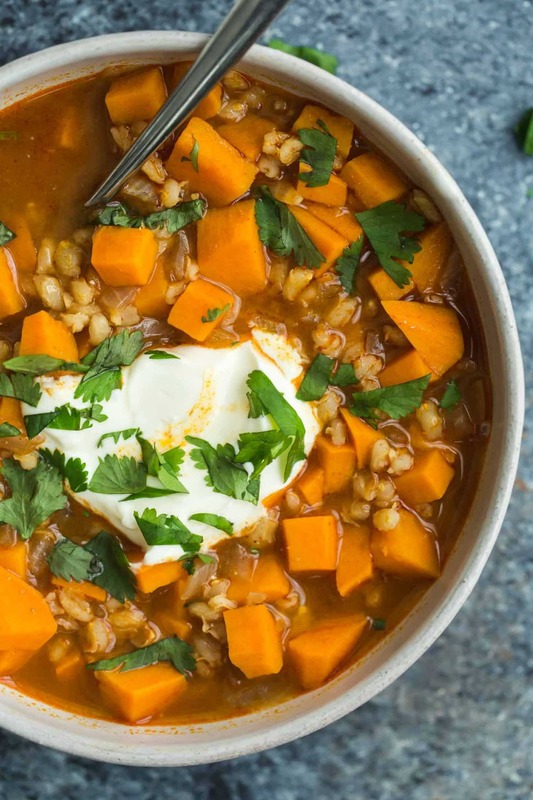 This barley stew can knock out (potentially) all three. 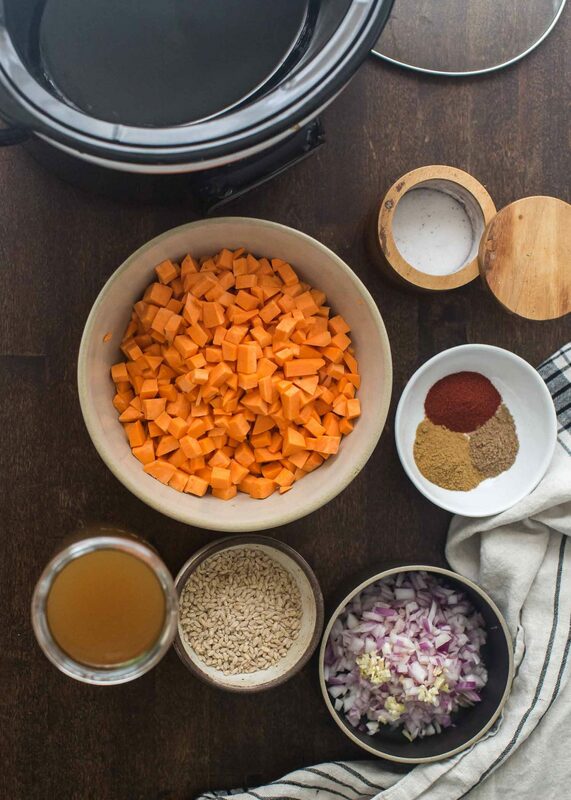 It’s easy to prep, just a bit of chopping, then everything goes into the Crock-Pot® slow cooker. 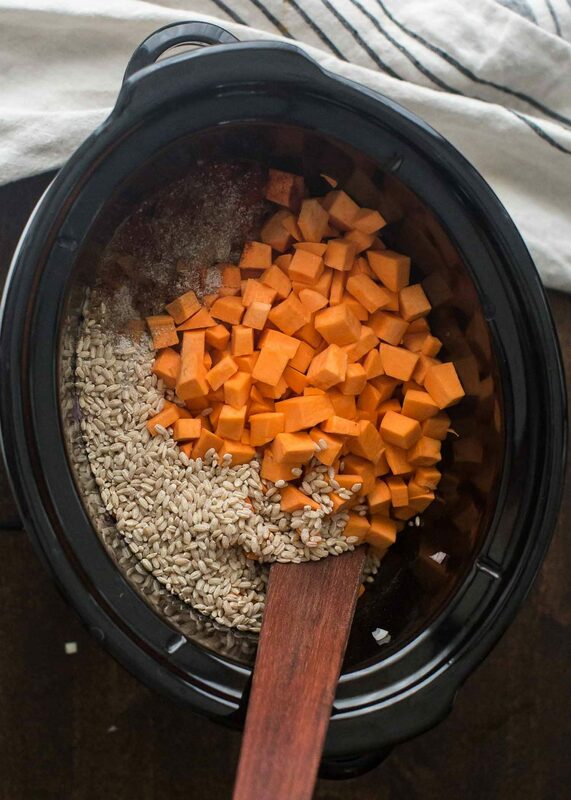 Start it in the morning on low and by dinner you have a delicious homemade meal that is full of sweet potato goodness. Plus, if you’ve never tried barley- this is about as easy as it gets! 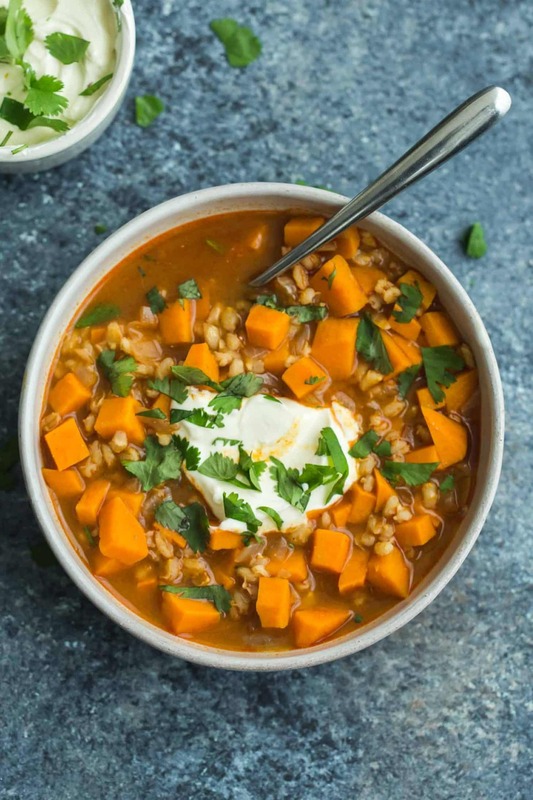 A hearty winter barley stew that features slow-cooked sweet potatoes and chewy barley. 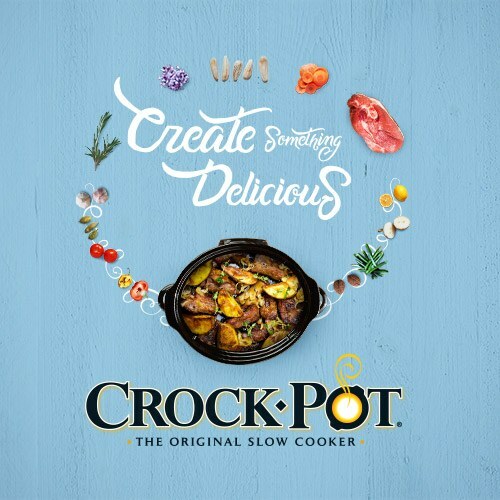 Heat a Crock-pot® slow cooker over high. Add the olive oil, red onions, and garlic. Stir to coat the onions and let warm. Peel the sweet potato and dice into ½” sized pieces. Add to the slow cooker along with the barley, water, vegetable broth, cumin, smoked paprika, coriander, and salt. Set the slow cooker to high (for 4 hours) or low (for 8 hours). While the stew is cooking, stir occasionally. Add more vegetable broth, ½ cup at a time, if the liquid has absorbed too quickly. Tips & Tricks: I took the short prep-time approach and didn’t cook the onions beforehand. If you have the time, I recommend cooking the onions and garlic in the olive oil on the stovetop before adding to the crockpot. Add Greens: Collards, Kale, or Chard would be wonderful stirred in at the end. Shred the greens and stir into the soup about 30 minutes before serving. Spice: Add a pinch or two of cayenne to spice up the overall dish or you can serve the soup with a sprinkle of hot sauce. Gluten-free: I love that even after a few hours in the slow cooker, the barley still has a slightly chewy texture. Gluten-free alternatives that will old up: sorghum or oat groats! Vegan: Leave out the sour cream and add a dollop of cashew cream before serving! 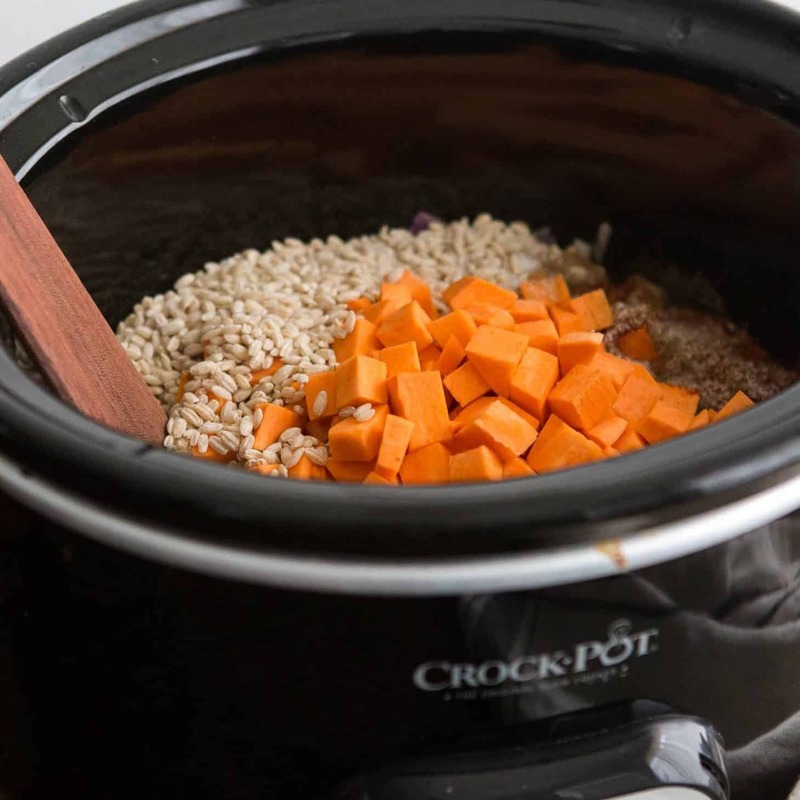 That Crock-Pot slow cooker looks like it can do wonders! I love your recipe. Please make more sweet potato recipe for me. Thank you! 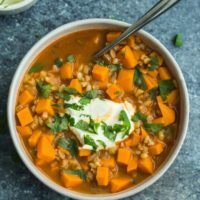 This one wasn’t my favorite – it ended up very mushy for me… I love the idea of a vegetarian slow cooker recipe, though! So strange! Barley usually doesn’t end up mushy at all- sorry to hear that. I don’t have a CrockPot — has anyone tried this on the stove top? It would work and probably take 45 minutes or so! Thanks for the quick reply, Erin! I made it on the stove top — turned out great. I am so happy to have found your website — I can’t wait to try more recipes 🙂 Thanks for sharing your wonderful creations!